I wasn't quite sure what they were doing peeking under the recycling dumpster, actually. I had just parked my car and was headed inside the Safeway to Starbucks and a desperately needed morning kick-off latte. There were two of them, a well-dressed woman and a man, and I thought perhaps they had dropped something underneath while they were recycling - keys, or a wallet, maybe. I walked into Safeway, ordered my coffee, and then watched through the glass window as events unfolded. You see it wasn't keys or a wallet under the recycling dumpster. No, it was a tiny black kitten, about 3 months old, and the people were trying to coax it out. Scared, damp, they finally managed to convince her to come out, and then they brought the kitten inside the lobby of Safeway. And what happened next was perhaps the truly incredible part. This is the part I will always remember, because it speaks to us as humans, and as a community. The people had, apparently, found the kitten inside the dumpster. Some cruel person, some soulless human being, had dumped it there. Why? I cannot fathom that, and never will. What many don't know about me is that I spent years working in veterinary clinics, and my love affair with animals goes back further than I can recall. Animals bring out all that is good in me. The way we treat our vulnerable - animals, children, and the elderly - tells you a great deal about our values and our society as a whole. Those who mistreat those groups, who abuse or belittle them? Well, not only do I not comprehend that I abhor it. So, the kind folks who rescued the kitten brought it inside Safeway and the wee kitten, black as night, was attracting a crowd. I did not step in yet, although I knew I would if necessary because I know a few people at the local SPCA and I would contact them if required. I suspected my assistance would not be required, though, as several people seemed intent on looking out for the kitten, including a young woman named Kelli Stewart. 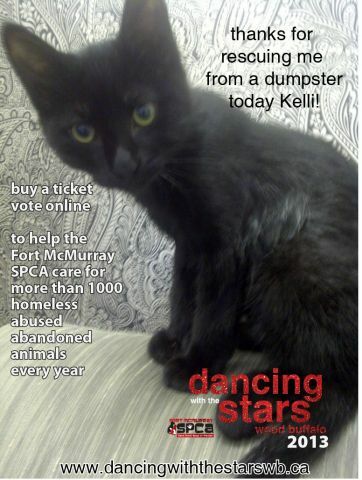 Now, I don't know Kelli, but when I introduced myself later she told me she is in Dancing with the Stars Wood Buffalo, an SPCA fundraiser. It also turns out she is an instructor at the dance academy at MacDonald Island Park. When I saw Kelli, though, she wasn't dancing but juggling a cell phone and a black kitten, calling her contacts at the SPCA to arrange safe haven for a tiny frightened animal. I knew I did not need to intervene because Kelli and the others had the situation well in hand, and I needed to do nothing (except cuddle a small mewing damp black kitten, which I did briefly). I wasn't the only kitten cuddler in the crowd, though. Far from it. As I watched people came in and out of the Safeway lobby, stopping to cuddle the kitten. Young women, young men, older men in work coveralls - all stopping to say a few kind words to the kitten, and to the gathered rescuers who were awaiting the arrival of someone from the SPCA. Many petted the kitten, or cuddled it, and more than one expressed interest in adopting the kitten once it was in the care of the SPCA. You see there is something about a tiny creature in distress that brings out the protective side in all of us, the side that wants to do good and make the world a better place. And on that Friday morning a tiny black kitten touched the hearts of so many people, and reminded them of that compassionate part of themselves. I don't know if they all went on with their day with a small smile about a tragedy averted, about a happy ending for a wee jet-black cat, but I did, and I suspect they did, too. I suspect many of us went away muttering dark things about the nature of anyone who could put a kitten into a dumpster, but for me those who rescued the kitten didn't just rescue the kitten - they rescued my faith and hope, too, because they showed that for every one kitten-dumpster-type there are dozens who will stop their entire day just to save one small black kitten. For every one person with a dark heart there are hundreds with hearts full of compassion and love, and hearts that embrace small black kittens in need. And many of those warm hearts live right here, in my own community. The kitten, by the way, did end up in the care of the SPCA, and by all reports is doing fine. I heard a rumour that someone has already requested to adopt it as soon as it is ready, and I am mildly disappointed as I had planned to suggest to the Intrepid Junior Blogger that we do so if anyone else did not step forward. The thing is, of course, that many of the animals at the SPCA have very similar stories to the wee black kitten, and so when the time comes for us to adopt (and we do plan to add a cat to our house of one adult, one teenager, one dog, and three ferrets) we too will be rescuing an animal. We too will take an animal that has known fear and bring it into our warm home, and our warm hearts, and love it for the rest of its life. Yesterday morning I witnessed something truly lovely, right in the Safeway downtown parking lot. I saw compassion, and concern. I saw a love for animals, which to me is always a beautiful thing, because I have always believed that while animals do not make our whole lives they make our lives whole. I saw a kitten rescued from a likely tragic end, and I saw something else. I saw community. I suspect I will remember the face of every one of the kitten rescuers, although I know the name of only one. I will remember them because they are heroes of this community, whether they know it or not. Heroism isn't just about running into burning buildings to save lives. Heroism is really about doing the things that need to be done, big or small. Heroism is about doing whatever you can to make the life of someone else better, whether it is volunteering or donating or, in this case, rescuing a tiny black kitten in a dumpster. Heroes aren't nearly as rare as we think they are. They are around us every single day, often quietly standing beside us until they are compelled to act. In fact heroes aren't rare at all. I would say most of us have one right inside of us if we just let them come out and rescue kittens in Safeway parking lots. but you are heroes in my heart. with her act of kitten-rescuing heroism. and a lot of heart.